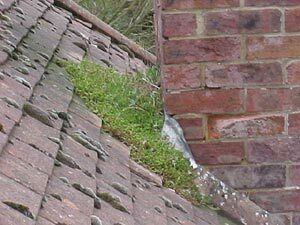 In parts of the world where there is substantial wet weather it is not uncommon to find moss, lichen and algae growing extremely well on roofs (Figure 1, 2 and 3), decks, walkways and on outdoor structures (especially the side of a building that is shaded). If you want to remove and prevent the reoccurrence of the moss, lichens and algae there are some steps that you can take that should be beneficial. A power washer (Figure 4) is an excellent tool to remove the growth of these plants. However, a power washer can do a lot of damage if not used properly, especially on roofing materials such as asphalt shingles. The growth of these plants is directly proportional to the amount of organic items, such as leaves, that are allowed to pile up on exposed surfaces such as roofs. Remove all organic debris as soon as realistically possible from your roof and walkways. 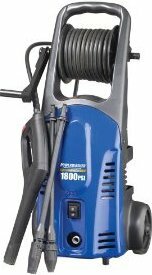 Commercial moss removers are the best products to use to eliminate current growth and prevent the plants from returning in the future. The best time to apply these moss removers is during dry weather conditions and when the moss is in growth mode. 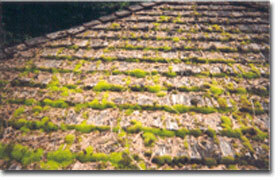 Liquid and dry granular moss removal products containing zinc sulfate are produced for homeowner application. They, as a general statement will not cause damage to any other plants. If you have copper eave troughs (gutters) or down piping or if you have copper lightening arrestors on your roof DO NOT use any products that contain zinc, as zinc will corrode anything made of copper. As with any chemical products always read the directions and warnings prior to using them. It was believed that iodized salt would remove moss, however, it will corrode any roof flashing or other metal that it comes in contact with - and it does not control moss growth effectively. 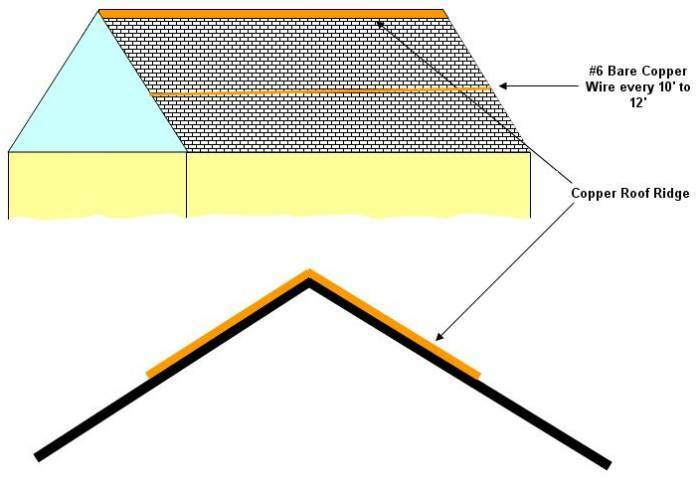 One control method that does appear to work is to use a length of sheet copper on the roof ridge and if the roof is longer than 10 feet to add copper wire at intervals along the roof, as shown in Figure 5. As it rains, copper ions are washed from the copper and flow down the roof, moss, lichens and algae will die when confronted with copper ions. The copper ridge cap has no specific dimensions, 4 to 6 inches wide should be sufficient. Flat copper material can be purchase from any metal supply house. Tell them you want sheet copper for roofing - most suppliers will even cut it to size for you. Bare #6 AWG copper wire, as shown in Figure 5 and 6, can be purchased at any electrical supply or most industrial metal houses. A copper bar or rod, which in some cases may be easier to install, can be used in place of the wire if desired. The copper roof ridge and the copper wire should be grounded to a copper cold water pipe or to a rod that has been driven into the ground. Lightening arresters should also be considered. Before and after pictures of an actual installation using a copper ridge and copper wire.